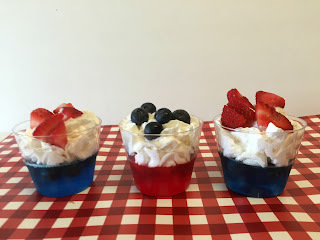 Since the #CookoutWeek event is ending right before the Fourth of July when cookouts are as common as fireworks, I wanted to share a easy dessert recipe with you that is color-coordinated with the holiday, super tasty and fits in at any cookout. Jello and cookouts go hand in hand right? I honestly hadn’t made jello in quite some time before making this recipe but after stirring in the hot and cold water and waiting for it to set, I was immediately transported back to my childhood, repeatedly opening the fridge and jiggling the containers to see if the jello had set yet. Doesn’t jello just make you happy? I couldn’t stop grinning the whole time I was making this recipe. I honestly can’t wait to make it again and take it to one of my mom’s pool parties. For this recipe, I purchased 5 oz. hard plastic clear cups from Amazon. 2. Drop a tablespoon or so of chopped berries into the jello before it sets. 4. Drop a tablespoon or so of blueberries into the jello before it sets. 5. 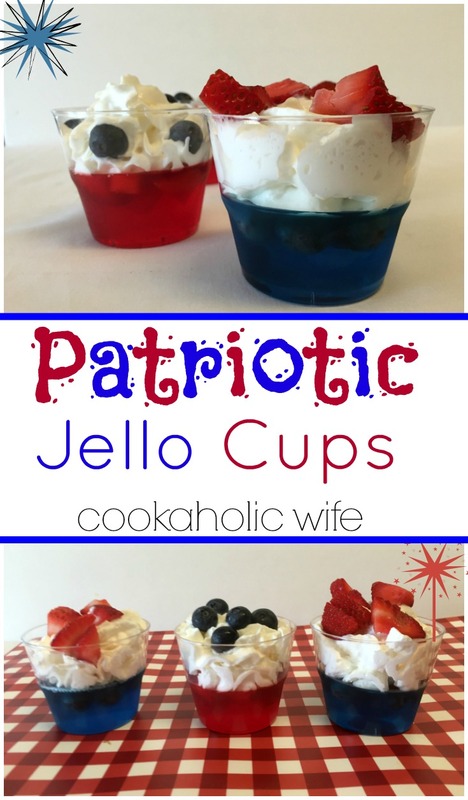 Refrigerate for at least 2 hours or until jello has set. 6. Fill each cup the rest of the way with whipped cream. 5. 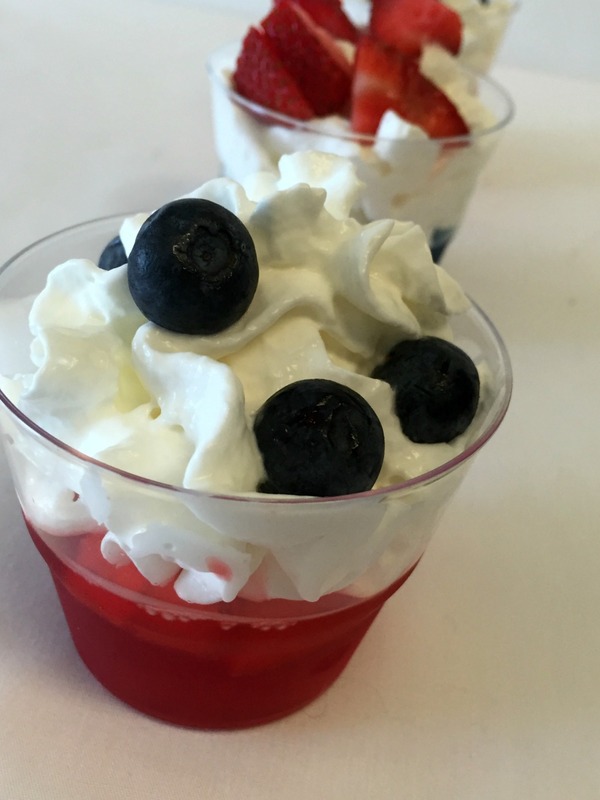 Sprinkle blueberries on top of the strawberry jello cups and strawberries on top of the berry blue jello cups. Serve immediately. To be honest, I was a little worried about taking the leftovers into work. I figured my coworkers (all men) would roll their eyes at red and blue jello with fresh fruit on top. Instead it seemed as though I brought out the child in all of them as they all grabbed a jello cup and a spoon the minute they found them in the fridge. 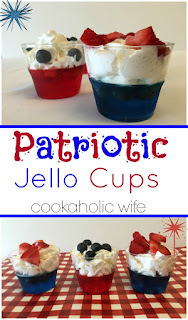 Everyone loves jello and these are a perfect patriotic treat. A cute, refreshing dessert, Nicole! 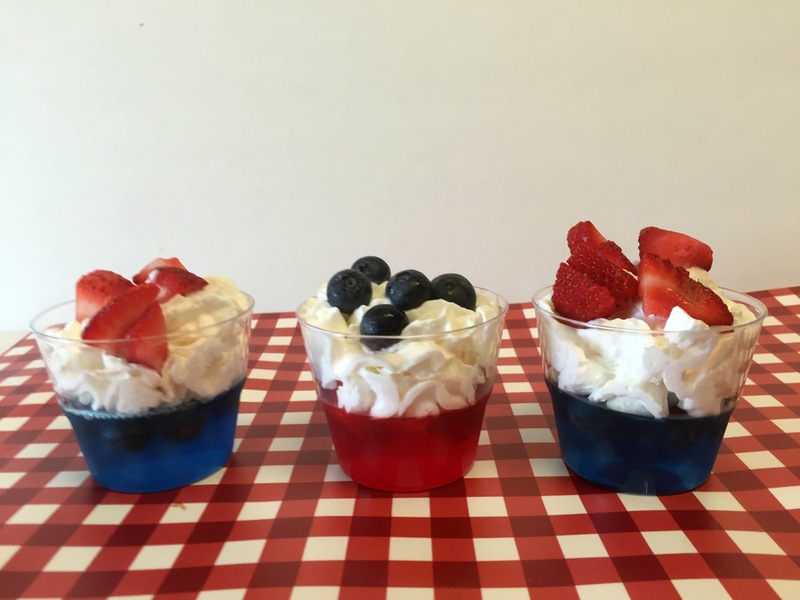 Wonderful and refreshing desserts for the 4th! and a great gathering of delicious dishes. Such a cute treat for the holiday!